This is by far one of my favorite soups. It's simple to make, delicious, nutritious, and the variations are seemingly endless. Listed below is the basic recipe but you can add any number of your favorite ingredients to make it a meal-in-itself. 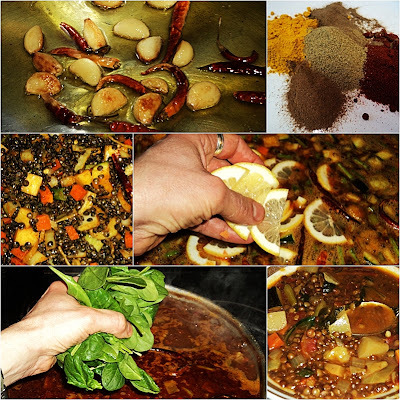 The recipe below, for example, is vegetarian but this is equally delicious with the addition of lamb, chicken, or even shrimp. I made this for staff lunch today (leftovers for tomorrow...yum) and I kept it vegetarian but I did veer from the recipe somewhat. A couple things I did differently were that I slowly cooked whole garlic cloves and chilies in olive oil prior to adding the vegetables and spices, and I also added slices of lemon, not just the juice...when the soup cooks the garlic and lemon disintegrate into the broth becoming part of the soup itself. I also added extra vegetables not included in the recipe...cabbage, rutabaga, green beans, and spinach. For the most part I kept the seasonings the same, but I did add a little smoked paprika and turmeric (turmeric not only colors and seasons food, it is extremely good for you). All-in-all, while this is sort of a stone soup version of this recipe, it's not too far off the original path. Anyhow, if you enjoy soup--flavorful and healthy soup--I encourage you to try this recipe, and experiment with your own version...you'll be glad you did. And the simmering spices will make the house smell good, too. Heat the olive oil in a heavy-bottomed pot. Add the onion, car­rots, celery, bell pepper, and garlic; sauté over medium heat for 5 minutes. Stir in the chili powder, cumin, cinnamon, allspice, cayenne pepper, salt and black pepper; sauté for 2 minutes longer. 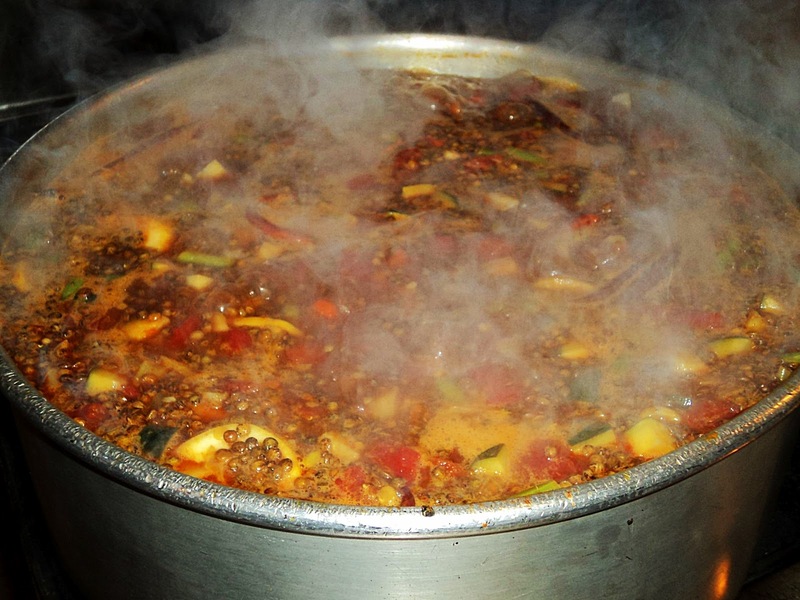 Add the tomatoes, lentils, broth, lemon juice and bay leaf; bring to a boil then lower it to a simmer. 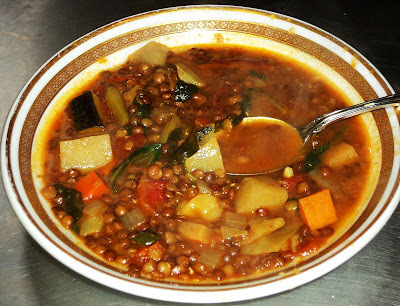 Allow the soup to cook for 60-90 minutes or until the soup thickens and the lentils become very soft. Now yer talkin' my language, I practically live on this stuff. I do, however, find that bok choy beats all hell out of celery and spinach. A shot of brandy don't hurt neither. This soup is definitely on the menu for the weekend! Can't wait to give it a go. KFG & Kevin...thanks. I love legumes, spices, vegetables, and soup.